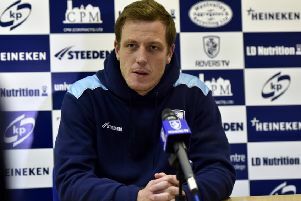 FEATHERSTONE Rovers have pulled off a major coup by snapping up Leigh Centurions’ Martyn Ridyard on a two-year deal. Ridyard is head coach John Duffy’s sixth new recruit ahead of the 2018 season, after the former Leigh and Huddersfield stand-off turned down offers from elsewhere to join the Rovers. The playmaker, who achieved promotion to Super League with the Centurions in 2016, made more than 200 appearances for his hometown club – scoring a total of over 1700 points. Ridyard joined Huddersfield on loan earlier this year and participated in the Giants’ Super-8s campaign. And after turning down an offer to remain with the Centurions for 2018, Ridyard cannot wait to begin the next chapter of his career at the LD Nutrition Stadium. Ridyardsaid: “I am really looking forward to the challenge ahead, having played all my career at Leigh – other than a stint with Huddersfield – this is something new for me. “It is a fresh challenge and one I cannot wait to get my teeth into. The idea of working with John Duffy was a major pulling point for me. “I have known him for a long time, I have played with him and I know what he is capable of. “The changes he has made and will continue to make here will make a great deal of difference. There is plenty for Featherstone supporters to be excited about going into 2018. “I am looking forward to meeting up with the boys in November and getting straight into the grind. “This is a team with a proud set of supporters and I have always loved playing here, so to be doing so for Featherstone will be extra special. “On paper, there is a fantastic squad in place here. I am looking to coming here and putting my own stamp on things. “My style of play is to control the game and take the team around the park, which, alongside the rest of the boys here, I will be looking to do. “In modern-day rugby league, pivots can play all over the park and there are some great ones here, which will keep us all fresh and fighting for places, while making us more dangerous as a team. Ridyard added: “Every year the Championship has got tougher and tougher but we will be right there in the mix with the likes of Leigh, Toronto, London and Toulouse. Rovers boss Duffy has spoken of his delight after Ridyard, a goal-kicker with a tremendous strike rate, agreed to join the club. “We are thrilled to have pulled off such a big signing for the club,” said Duffy. “We feel Martyn will bring a great deal to what we are trying to achieve here. “He brings strong leadership qualities and a fantastic track record. I feel he can be a genuine leader for the team going forward. “He has been there and done it all at Championship level and was a part of Leigh’s promotion last year. “I have worked and played alongside him in the past and know exactly what he is capable of and what he will bring to the party. Ridyard will start pre-season training alongside his new Featherstone team-mates early next month and will be in line to feature for the first time when Rovers take on Castleford on Boxing Day.